Well, we’ve made it through the busiest travel time of the year. Completely booked flights, cramped rows, and little-to-no-leg space can wreak havoc on the body. Not only does sitting in a semi-cramped position tighten your hamstrings, hips, and back, but taking to the sky also uproots your body’s downward-moving energy (known as apana vayu), often creating a general unsettled feeling even after you’ve landed. Lengthen your hamstrings and spine, open your hips and low back, and increase your circulation and energy with these simple yoga poses to ground your energy after flying. Standing with your feet hip distance apart and parallel so that your second toe is in line with the center of your ankle, press down evenly through all four corners of your feet: mound of the big toe, inner heel, outer heel, and mound of pinkie toe. With your hands on your hips, inhale and lift your chest as you continue to root down through the legs; exhale and gently bend your knees as you slowly hinge forward at your hips, lengthening your spine. 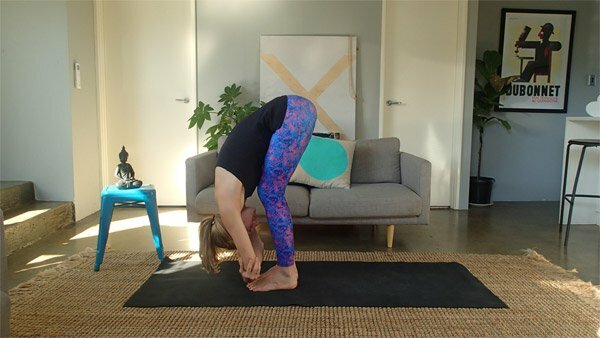 Staying in your Forward Fold for eight full rounds of breath, hold on to the back of the calves—bending the knees more or less as needed to compensate for tighter hamstrings. When you’re ready to rise, bring your hands back to your hips, lifting your elbows and shoulders up toward the ceiling. Rise with a flat back, taking your chest forward and up. As you rise, use your hands to press down through both legs. Coming into a squatting position with your feet hip distance apart and slightly turned out as needed, root your heels down into the mat as you keep your bottom off the floor. If your heels do not come down, try rolling up a blanket or the back end of your yoga mat and place it under your heels for support. This pose can also be done with your bottom on a block, especially for those with knee pain. With your hands together in prayer before your heart, press your elbows into your inner knees, widening the legs and lengthening the spine from tailbone to crown. As you do so, press your inner knees back into your elbows, rooting down through both the inner and outer edges of your feet. Sitting on the earth, or with your pelvis raised on a blanket or cushion if your hips and groin are tight, bring the soles of your feet together, allowing your knees to fall open to the sides. Holding on to the front of your ankles bones, press the outer edges of the soles together as you lengthen your torso upward, releasing your inner thighs and groins down towards the earth. Inhale, and as you exhale come into a Forward Fold from the waist, walking the hands forward as needed. Rather than bringing your face down to your feet, continue to extend your spine forward, reaching your heart past the tips of your toes. Despite common belief, the goal of this pose is not for the knees to come closer to the floor. Instead, concentrate on your inner upper thighs (the inseams of your pants) turning down to the floor between your legs. Never force your knees down, and try to avoid bouncing of the legs. If you don’t do any of the above poses, do Legs-Up-the-Wall for five or 10 minutes and you will ground your nervous system and boost your circulation, quickly recovering from all of your holiday travel. Start by sitting on the floor, with one hip against the wall your hands supporting you. To come into the pose, swing your legs up the wall as you gently lower your shoulders and head to the earth. Lying with your back flat, rest your arms away from your body, palms up, shoulders relaxing into the earth. To release, bend both knees into your chest, roll to one side, and take a few breaths. When you’re ready, place both hands flat on the ground, and use the strength of your arms and core to push yourself back up to sitting. Whether or not you’ve just stepped off a plane or are simply feeling the effects of the holiday craze, try these four poses and let me know if you don’t feel more grounded after.